One of the most common chronic diseases is diabetes. Diabetes is a heterogeneous group of diseases of the metabolism that is characterized by the chronic hyperglycemia and impaired metabolism of carbohydrates, fats, and proteins and is caused as a result of defects in insulin secretion or insulin functioning. The main symptom of diabetes is high blood sugar (hyperglycemia) that varies over time. This reflects the severity of the underlying traumatic process that may progress or regress or remain stable. With these changes, the effect of treatment varies, too, but it does not indicate a change in the nature of the disease process. Insulin is a hormone produced by the beta cells of the pancreatic islet cells and is necessary for the body to metabolize glucose in the blood flow. The World Health Organization has identified four major types of diabetes: type I diabetes, type II, gestational diabetes, and diabetes secondary to other conditions. Approximately 90%–95% of patients with diabetes mellitus type II that is “non-dependent diabetes mellitus” (NIDDM) is suffering since the pancreas which also produces at least some amount of insulin, and the treatment often does not involve insulin injection. Most patients with NIDDM can often control their blood sugar without insulin injection and through constant and special diet and drug use. Although NIDDM may occur at any age, it usually occurs after age 40. Most patients with NIDDM are overweight and it appears that their body produces high level of insulin; however, their body seems to be resistant to controlling the blood sugar using the body insulin. In addition, studies have shown that complications are common in these patients, especially long-term complications such as retinal damage and blindness, peripheral neuropathy, pain in the feet and legs, stroke, myocardial infarction, peripheral vascular diseases, kidney disease end stage, mutilation and psychological problems, and individual, family, and social complications which are among the side effects of diabetes. Patients and governments are faced with the direct and indirect and heavy costs of eradicating these problems. The most important of these complications are psychological disorders that influence the patient's ability to perform and continue the recommended medical care negatively. Psychological stress can trigger or worsen glucose levels through activating hypothalamic-pituitary-adrenal. Although chronic diseases are accompanied with an increased incidence of depression, anger, and stress, this is about three times more common in diabetic patients and the prevalence of depression in these patients is 63.3%. Common emotional response at the time of diagnosis is anxiety and anger, but with the progression of the disease, psychological disorders are more pronounced. For the treatment of psychological disorders and chronic patients, especially diabetics, in addition to drug treatments, psychological treatments have been developed over consecutive years. Despite strong evidence regarding the effectiveness of known standard and usual therapies (treatment as usual), multiple results suggest the use of, for example, cognitive-behavioral therapy, for many of the therapists and patients with chronic disease, is difficult and often medical intervention, even with the most careful planning and execution are not met with good response., Today, we are facing the third generation of these treatments that can be generally called acceptance-based models such as cognitive therapy based on mindfulness (Mindfulness-based cognitive therapy), Metacognitive treatment, and acceptance and commitment therapy (ACT). In this treatment instead of cognitive change, attempt is made to increase one's thoughts and feelings (10). One of the treatments that have recently been the focus of several researchers is ACT. The main purpose of the ACT is mental flexibility that is enabling the patients to practically make the best choice rather than imposing an action on them to avoid thoughts, emotions, memories, or chaotic tendencies. The first attempt in this treatment is to try to increase mental acceptance of perceptions and to reduce ineffective control measures mutually. The patient is taught that every attempt to avoid or control these undesirable mental perceptions is ineffective or has adverse effect and would result in their reinforcement. Therefore, they must completely accept the experience without any internal or external reaction to remove them. In the second phase, the mental awareness is increasing in the moment, that is, people will be aware of all psychological moods, thoughts, and behaviors. In the third stage, the person is taught to separate from these mental experiences (cognitive separation) so that they can act independent of the experience. Fourth is the effort to reduce excessive focus on self-image or personal story that one has in his/her mind. Fifth includes assisting the individual to recognize and distinguish his/her personal values and change them to behavioral goals (transparency of values). Finally, comes the motivation to act responsibly that is the activity focused on the goals and values identified with the adoption of mental experiences. While empirical evidence regarding the effectiveness of psychological treatment for multiple disorders such as depression, obsessive–compulsive disorder, trichotillomania, anxiety, borderline personality and eating, and chronic pain is increasing,, relatively few studies have examined this type of therapy in the treatment of psychological symptoms and improving life satisfaction in chronic patients, especially Type II diabetes. Considering the novelty of this method, examining its effectiveness in psychological health, especially in the chronic disease is necessary because it can make a difference in the mental treatment of the patients' disorders and result in its improvement. According to the mortality rate of these disorders (approximately 2% of mortality), a review of literature related to access to the most useful treatment options seems necessary. In this regard, although primary prevention is not always efficient and effective, the evidence suggests that secondary prevention (treatment interventions) can significantly reduce psychological, social, health, and economic future, and the empirical evidence on the effect of ACT on multiple disorders is on the rise. Therefore, this study aimed to investigate the effect of ACT on mental health of patients with diabetes. This is a quasi-experimental study applying pre- and post-test design with the control group, in which after determining and random selection of control and experimental groups, eight intervention sessions each lasting 1.5 h (90 min) were applied to the experimental group, and after therapy sessions, both the control and experimental groups were assessed. The population consisted of women with Type II diabetes referred to Taleghani Speciality and Subspecialty Clinic and Training Center in Kermanshah. Using availability sampling, 26 patients were selected, and applying complete random drawing, even and odd numbers were put in the experimental group (n = 13) and the control groups (n = 13), respectively. The questionnaire contained 28 questions and four subscales. Questionnaire subscales included: somatization, anxiety syndrome and insomnia, social dysfunction, and depression syndrome. The overall score of each individual was the sum of individual scores obtained on the four subscales. Multiple-choice type questions were based on the Likert scoring methods and options were scored as 0, 1, 2, and 3. Rating of 0 to 27was considered as a sign of good general health, 28–55 was average general health, and 5–84 was a sign of undesirable general health. In a study Palahang et al., who examined validation of the 28-item general health questionnaire, the reliability (assessed through test) was reported to be 0.91. The protocol of the training sessions were taken based on the research done by Hayes, Streswell and Wilsonm in 8 sessions of 90 minutes. The summary of the content meeting of each session is presented below [Table 1]. A total of 26 women with the age range of 25–65 years were selected from the intended population and were included in the research. About 43.66% were in the age range of 25–35 years, 45% were in the age range 36–46, and 12.34% were 46 years and older. The descriptive findings of the present study including statistical indices such as mean and standard deviation of the variable studied, is presented in [Table 2]. In order to evaluate the presumptions of the analysis of covariance (ANCOVA), firstly the homogeneity of slopes of pretests and posttest scores were calculated. Multivariate ANCOVA was used to compare experimental and control groups with respect to mental health scores. The results showed that the tests were significant (P<0.01) [Table 3]. This means that there was a significant difference at least between two groups. The results are shown in [Table 4]. Considering the Eta square of 0.91, it can be said that 91% of the changes in the dependent variable was due to effectiveness of the independent variable [Table 2], [Table 3], [Table 4], [Table 5]. This study aimed to investigate the effect of ACT on mental health of patients with diabetes. The results of this study using covariance analysis showed that the difference between mental health scores by group membership (two experimental and control groups) in the posttest was significant (P < 0.05). Therefore, intervention by acceptance and commitment (ACT) model had a significant impact on mental health in the experimental group (P < 0.05). The findings of the study are consistent with the results of most previous studies including Graham et al., Levin et al., Johns et al., Rigi Kootesh et al., Yazdanbakhsh et al., Baeati et al., Lindholm-Olinder et al., Behrouz et al., and Ziapour and Kianipour. ACT has been largely and successfully used in improving psychological well-being and coping styles in clients. To explain how this type of therapy affects the mental health indices in chronic patients, especially Type II diabetic patients, it can be said that with respect to clinical observations by referring to the treatment protocol used in this study, the cause can result from change of attitude in thoughts and cause of thoughts, irrational and negative cycle, and faulty thinking. The goal of treatment is, therefore, to start training based on knowledge and creative helplessness compared to previous solutions from the start and subjects' (patients) acceptance of this novel attitude. According to the findings of the study, since variable of psychological acceptance increased before a significant decrease in indicators of mental health, it can be concluded that the variable of acceptance and increased attention and action value act as mediators in change and are effective in improving the indicators of psychological acute diabetes. Another process that is emphasized in ACT and has an outstanding role in the treatment protocol is emphasis on committed action. Encouraging chronic patients to clarify the values, goals, anticipate obstacles, and the commitment to carrying out actions to achieve goals and moving toward values, despite illness and obstacles, leads to the realization of the goals and the resulting happiness that affects enhancing and improving the health possible. This, in turn, relieves the individual from getting stuck in a loop of negative thoughts and feelings of lack of control of values and the inability to save lives. In general, the effectiveness of ACT treatment in mental health scores in Type II diabetic patients is justifiable based on the principles of staying in the present, observation without negative judgment, acceptance and raising awareness of the experience, and creating adaptive response. The findings of this study were consistent with previous studies on the effectiveness of ACT chronic mental health patients, especially Type II diabetes. Moreover, the findings showed the importance and necessity of providing solutions for the treatment and prevention of chronic diseases, especially diabetes given that it is one of the most serious diseases in the world. 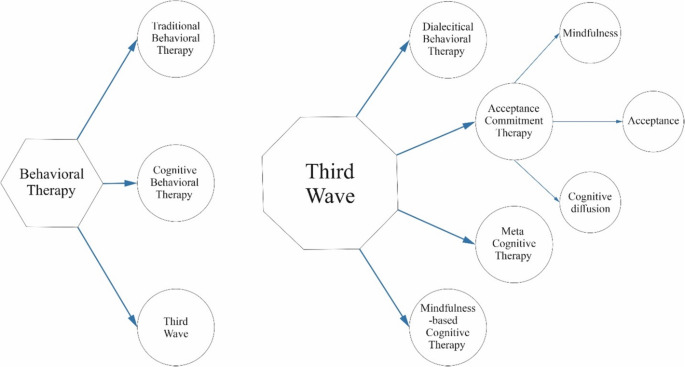 Treatment based on acceptance- and commitment-based model on mental health, it can be used as a complementary treatment to enhance mental health and the overall mental state of patients with diabetes along with drug therapy. The authors of the present study would like to extend their sincerest thanks and appreciation to the personnel of Kermanshah University of Medical Sciences as well as the participants in the study and all the people contributing to this research. Narayan KM, Gregg EW, Fagot-Campagna A, Engelgau MM, Vinicor F. Diabetes – A common, growing, serious, costly, and potentially preventable public health problem. Diabetes Res Clin Pract 2000;50 Suppl 2:S77-84. Standl E, Schnell O, McGuire DK. Heart failure considerations of antihyperglycemic medications for type 2 diabetes. Circ Res 2016;118:1830-43. Zawiejska A, Wender-Ozegowska E, Grewling-Szmit K, Brazert M, Brazert J. Short-term antidiabetic treatment with insulin or metformin has a similar impact on the components of metabolic syndrome in women with gestational diabetes mellitus requiring antidiabetic agents: Results of a prospective, randomised study. J Physiol Pharmacol 2016;67:227-33. Ziapour A, Khatony A, Jafari F, Kianipour N. Patient satisfaction with medical services provided by a hospital in Kermanshah-Iran. Acta Med Mediterranea 2016;32:959-65. Makvandi HS, Rezaee A, Azadi M. Effectiveness of acceptance and commitment group therapy on the self-management of type 2 diabetes patients. J Clin Psychology 2014;5:55-62. Whittemore R, Jaser S, Guo J, Grey M. A conceptual model of childhood adaptation to type 1 diabetes. Nurs Outlook 2010;58:242-51. Waldron B, Benson C, O'Connell A, Byrne P, Dooley B, Burke T. Health locus of control and attributions of cause and blame in adjustment to spinal cord injury. Spinal Cord 2010;48:598-602. Sharpe L, Curran L. Understanding the process of adjustment to illness. Soc Sci Med 2006;62:1153-66. Téllez-Zenteno JF, Cardiel MH. Risk factors associated with depression in patients with type 2 diabetes mellitus. Arch Med Res 2002;33:53-60. Eizadi A, Neshatdoost H, Abedi M. Case study of ACT effectiveness on prevalence and severity of OCD symptoms. Zahedan J Res Med Sci 2013;1:20-6. Glover NG, Sylvers PD, Shearer EM, Kane MC, Clasen PC, Epler AJ, et al. The efficacy of focused acceptance and commitment therapy in VA primary care. Psychol Serv 2016;13:156-161. Leigh E, Clark DM. Cognitive therapy for social anxiety disorder in adolescents: A development case series. Behav Cogn Psychother 2016;44:1-17. Hayes SC, Pistorello J, Jacqueline L, Michael E. Acceptance and commitment therapy as a unified model of behavior change. Couns Psychol 2012;40:976-1002. Thomas N, Shawyer F, Castle DJ, Copolov D, Hayes SC, Farhall J. A randomised controlled trial of acceptance and commitment therapy (ACT) for psychosis: Study protocol. BMC Psychiatry 2014;14:198. Graham CD, Gouick J, Ferreira N, Gillanders D. The influence of psychological flexibility on life satisfaction and mood in muscle disorders. Rehabil Psychol 2016;61:210-7. Nazari B, Bakhshi S, Kaboudi M, Dehghan F, Ziapour A, Montazeri N. A comparison of quality of life, anxiety and depression in children with cancer and healthy children, Kermanshah-Iran. Int J Pediatr 2017;5:5305-14. Johns LC, Oliver JE, Khondoker M, Byrne M, Jolley S, Wykes T, et al. The feasibility and acceptability of a brief Acceptance and Commitment Therapy (ACT) group intervention for people with psychosis: The 'ACT for life' study. J Behav Ther Exp Psychiatry 2016;50:257-63. Noorbala AA, Bagheri Yazdi SA, Asadi Lari M, Mahdavi V, Reza M. Mental health status of individuals fifteen years and older in Tehran-Iran (2009). Iran J Psychiatry Clin Psychol 2011;16:479-83. Yaghubi N, Nasr M, Shahmohammadi D. Epidemiology of mental disorders in urabn and rural areas of Sowmaesara-Gillan. Iran J Psychiatry Clin Psychol 1995;1:55-60. Levin ME, Hayes SC, Pistorello J, Seeley JR. Web-based self-help for preventing mental health problems in universities: Comparing acceptance and commitment training to mental health education. J Clin Psychol 2016;72:207-25. Rigi Kootesh B, Raisi M, Ziapour A. Investigation of relationship between internet addict with mental health and quality sleep in students. Acta Med Mediterr 2016;32:1921-5. Yazdanbakhsh K, Kaboudi M, Roghanchi M, Dehghan F, Nooripour R. The effectiveness of acceptance and commitment therapy on psychological adaptation in women with MS. J Fundament Appl Sci 2016;8:2767-77. Lindholm-Olinder A, Fischier J, Fries J, Alfonsson S, Elvingson V, Eriksson JW, et al. A randomised wait-list controlled clinical trial of the effects of acceptance and commitment therapy in patients with type 1 diabetes: A study protocol. BMC Nurs 2015;14:61. Behrouz B, Farhadi M, Bakht N, Akbari F, Heidarizadeh N. The prevalence of psychological disorders in patients with type II diabetes: The importance of gender and physical activity. Urmia Med J 2014;25:561-70. Ziapour A, Kianipour N. Relationship between personality traits and mental health among the staff in Kermanshah university of medical sciences 2015. J Med Life 2015;8:122-8.